With the expected summer release of OS X Mountain Lion just a few months away, Apple on Monday sent out a mass email to Mac developers urging them to apply for a Developer ID in preparation for the new operating system's Gatekeeper security system. The email says that while the Mac App Store is the safest place for users to download software for their computers, the company is concerned about protection from possibly malicious applications obtained through unmonitored channels. To block these unwanted programs from making their way onto users' Macs, Apple has created the Gatekeeper security system which will be running behind the scenes in the next-generation OS X Mountain Lion. With Gatekeeper, software can only be installed if it is digitally signed by a vetted developer who has been assigned a Developer ID. The system allows for verified applications, plug-ins and installer packages to be installed while blocking those that are unsigned, thus lowering the possibility of running malware. Gatekeeper will allow users to select from three security levels. At its highest setting, the system will only allow the installation of applications from the Mac App Store, much like the current settings for iOS apps. The default setting will loosen restrictions and let users install software that has been digitally signed with a Developer ID regardless of its origin, while the lowest setting basically allows for the installation of any application. While not a full-fledged anti-virus program, it is hoped that Gatekeeper will help thwart future malicious software like the recent Flashback trojan which harvested user IDs, passwords and other sensitive information from over 600,000 Macs worldwide. 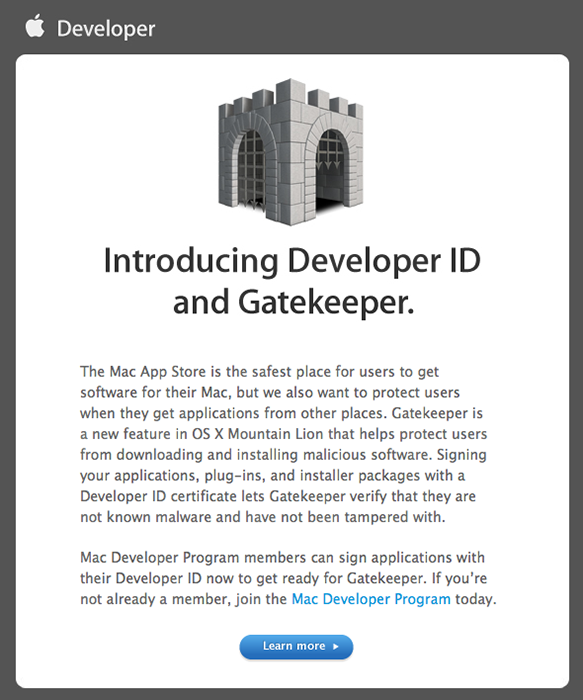 Apple is pushing Mac Developer Program members to apply for their free-of-charge Developer IDs so that their respective software offerings will be ready when Gatekeeper launches with Mountain Lion this summer. Monday's email is the second such invitation to developers, the first being issued in February.